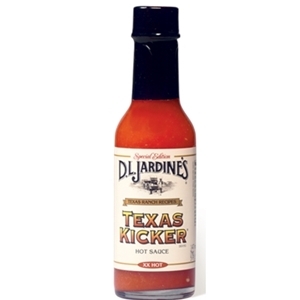 **Jardine's appears to have changed the recipe on their Texas Kicker hot sauce. Even though the ingredients are similar, our staff did a side by side taste test of the new and old sauce and did find that it tasted different. The old sauce had a more citrus flavor while the new sauce was less citrus and a bit more smoky or pepper flavor. The heat level seemed the same. Also, the newer version is produced in Columbia instead of Belize. BEST BY JULY 2019, being sold at a reduced price. Habanero peppers, carrots, onions, lime juice, vinegar,garlic and salt.